You went to Gen Con – Avoid Con Crud! 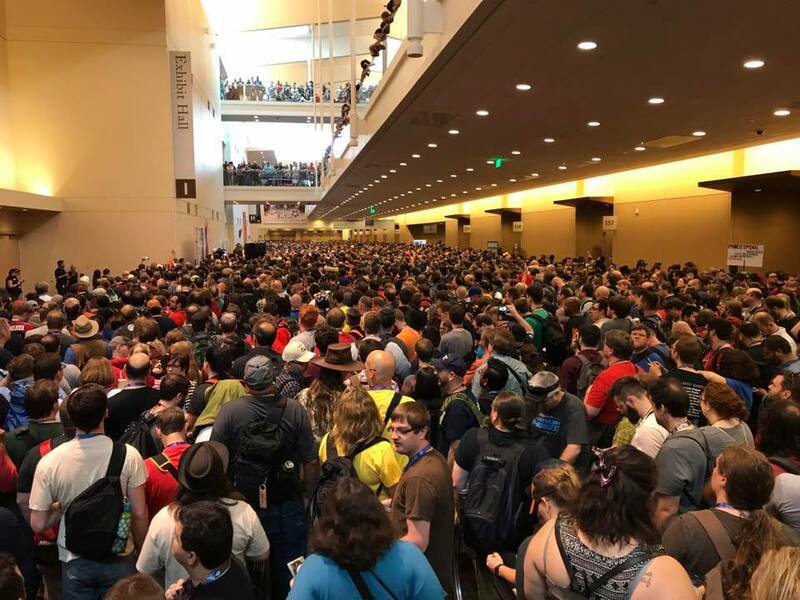 When attending conventions, especially large ones like Gen Con, there are thousands of people in a little bit of space. Inevitably folks share germs, bugs, and sniffles even when they are healthy. In the Navy we called it “Creeping Crud”, convention goers know it as Con Crud. There are a few steps you can take to minimize the effects of Con Crud, The following is my tactic for any convention experience. Shared here in the hopes of helping my fellow con-goers. I don’t want to send any germiphobes into a panic, but the following is my personal take on convention health and approach. It does include tending to germs and viruses. For myself, I start preparing the week before the convention by taking Multivitamins. Most people (Especially in the US) are well fed, but malnourished. Multivitamins bolster the immune system on all fronts, give you more energy, keep your mind sharp, and generally help mood and body maintain balance. I like the gummy bear type… I’ll admit it – I HATE pills. I attempt to bump the vitamin C a bit with extra oranges and citrus while minimizing any alcohol or other chemical intake that week. During the convention there will likely be some drinks, but there is no reason to lower your tolerance to Con Crud before you get there. Let’s not forget that you will also likely be on a plane, or traveling in a car some distance to get to most cons. During the convention you shake hands with a lot of folks. Hugs, signing books, high fives, fist bumps and whatever else folks do to interact. HAND WASHING is your friend. I take regular breaks to wash my hands with soap and hot water every hour or so (Sometimes more frequently after some intense interactions). Some hotel restrooms have luke-warm water, find a place with some hot water and remember it. I try to limit alcohol intake at the con for a number of reasons, a good one is that drinking too much can lower your resistance to virus and germ infection. If you are a smoker, smoking more can also lower your resistance. It’s okay to hang around the smoker’s hut to socialize, but keep your mind on how many you are lighting up and minimize that action. Remember to SLEEP! Rest is essential to fighting the crud, being on your A-game, and staying on track. Reserve an hour or two in the middle of the day to grab a nap if you have to. The hotel rooms tare more quiet mid day while folks are attending events. For a vendor, this is very important. You want your A game in the after hours as well as vending hours. Find good help tending the booth so you can get a break. Take in some sun – Just a 10-15 minutes a day in direct sun for fair-skinned folks produces as much as 10,000 IU of vitamin D. Along with the mental benefits of a sunny break, it’s worth a few minutes. Post Con recovery is tough, but it’s time to double-down on some things. Diet and Multivites particularly. Super foods are your friend! Raw spinach, greens, blueberries, almonds, apples, bananas, grapes. Eat them raw whenever possible and often. Day one post-con I usually double up on multivites, then continue regular vitamins for some time after. If you found a sniffle, things like Zicam and other OTC medications can shorten the lifespan of a cold (Or the crud) significantly. SLEEP – It’s still on the list and post-con more so. We schedule at least one extra day after conventions to do NOTHING. Sometimes we even tell friends and family we won’t be home until the day AFTER. Sleep, nap, rest, watch old Conan movies or Star Trek reruns. Let your body heal after all that action. Do laundry carefully. When you return from the convention, you are home, but your laundry is still lingering at the con. Toss the lot in on its own and wash your hands again after. There is the outside chance that the crud, you ran into that day is lingering in the laundry. It’s strange to think about it, but it can help you avoid the post-con-crud. The easiest way for myself to hit all these points is to continue before, during and after the con the following points. Cut down on over-processed, super fats and …. things I’ll be eating AT the con. Alcohol – in moderation at the con, not before. I also try to make a conscious effort while shaking hands and greeting folks to minimize how much I touch my face. It’s not that I don’t think my friends are unclean, it’s just a matter of avoiding Con Crud. These days it is more important to us than ever to avoid this plague. My mom has MS and she is staying with us while she looks for an apartment with the supports and maintenance she needs. Her immune system is compromised because of the MS, and bringing home the crud can just make the whole family miserable. Stay well, stay healthy, and share those Gen Con Pics!